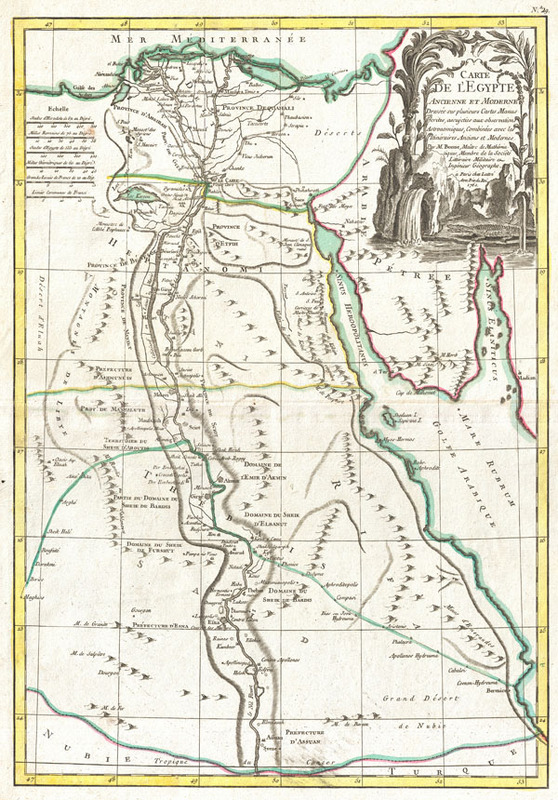 A beautiful example of Rigobert Bonne's 1762 decorative map Egypt. Covers from the Nile Delta south as far as Aswan and the border with Nubia and includes the Sinai and parts of the Red Sea. Makes note of both ancient and modern (c. 1762) sites. Details various Sheikdoms, Prefectures and Provinces throughout. An elaborate decorative title cartouche in the upper right quadrant features stylized date palms, the Nile cataracts, and a typically monstrous Nile crocodile. Drawn by R. Bonne in 1762 for issue as plate no. 29 in Jean Lattre's 1776 issue of the Atlas Moderne.